Ear acupuncture did not develop originally in the Orient, as is often thought. A French physician, Dr. Nogier, was intrigued by the folk remedy of cauterizing points on the ear for back pain, and as a result, sought to "map" the relationship of points on the ear to points on the body. His work in the 1950's eventually was presented at a conference in Germany, and gained the interest of researchers in China. The Chinese continued to try to find points on the ear which corresponded to areas on the body, and they used small seeds or needles to stimulate these points in the hopes of affecting pain and other disorders. Ear acupuncture is one of several "holographic" systems which theorize that the entire body can be represented in miniature within the body itself. In Japan, Dr. Yamamoto has developed a theory of scalp acupuncture based on this concept, and he has taught this approach to several groups of acupuncturists and physicians in the U.S.
Dr. Yamomoto feels that frequent stimulation of points on the scalp can be helpful in neurological disease and in the rehabilitation of stroke patients, and his own practice is focused on the treatment of these disorders. In a similar fashion, a form of hand acupuncture developed in Korea theorizes that all of the 12 primary channels and two of the secondary channels of traditional Chinese acupuncture are represented on the hand. Very small needles or magnets are used to treat these points with the goal of achieving the same result as treating the body points used by traditional acupuncturists. Chinese physicians have even theorized a system of "nose" acupuncture (which I have not personally investigated) which utilizes points on the nose to treat problems in other areas of the body. The benefits of ear acupuncture and stimulation of points on the ears with small magnets, seeds, and beads have yet to be studied in depth. I have found ear points to be useful occasionally as an adjunct to treatment of the body, though it is difficult to say how much clinical effect ear stimulation contributes when other components of Oriental medicine are utilized in addition. In the brain, there are larger representations of head and hand in association with actual brain structures than there are representations of other areas of the body. Because of the importance of facial expression and finger coordination in humans, stimulation of these areas may have increased potency when compared with other areas of the body. This may also be the reason why face, scalp and hand acupuncture have their effectiveness. Certainly Dr. Nogier investigated an intriguing and seemingly effective folk practice. Any low risk procedure that offers the promise of relief should be investigated, but the long term value of ear stimulation in pain control and to reduce appetite has not been rigorously studied. 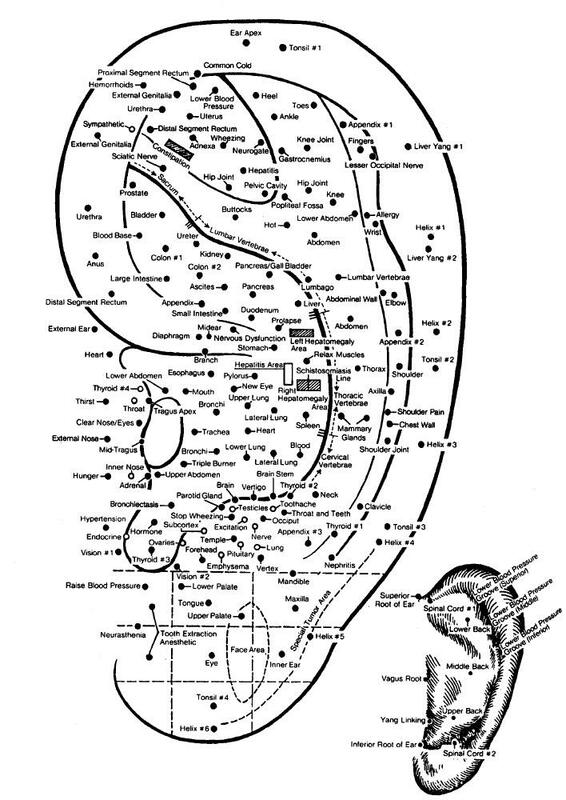 If you are interested in experimenting to see if ear stimulation can help the problem you are having, I suggest you try massaging the ear in the areas indicated on the chart with sesame oil, and see if you think there is a benefit. A fingernail or a dull probe, such as the tip of a ball point pen, might be used to press a particular point for 7-15 seconds to see if you note a benefit. Don't press to the point of extreme pain, but some discomfort is to be expected when stimulating the ear. Try stimulation twice or three times a day to see if you note any difference in the duration, intensity, or frequency of discomfort. If you find some value in ear stimulation, you may either continue massage on a regular basis, or you may attempt to focus in on a particular point on the ear. Expert acupuncturists will use a small needle at the point, or tape a small bead (like a tiny jewelry bead), or a seed, or even a small Korean hand magnet at the point. The needle certainly stays in place more easily than the tape, but must be removed if it is uncomfortable or if any signs of infection develop. Practically speaking, it is difficult to maintain any tape on the complex and flexible surfaces of the ear. Taped products such as the "acubeads" offer a convenient method of experimenting with ear stimulation if you can afford the expense. A commonly used correspondence system is shown in the image below. In order to make it possible to see all the tiny print on these maps, I have provided a larger file, so it may take a little longer for this page to load. To print it out, you can just "right-click" on the image. You can also download the image as a .pdf file here. Download ear image. With both modern and traditional medical systems, the value of each component may be limited when used in isolation. For those interested in Oriental medicine, the best results in the majority of patients will usually require a diagnostic evaluation to determine which of the aspects of any Oriental system of medicine is most applicable.